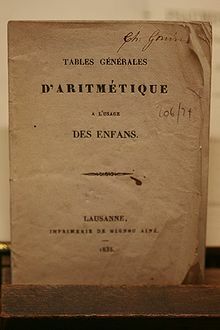 Arithmetic or arithmetics (frae the Greek wird ἀριθμός, arithmos "nummer") is the auldest an maist elementary branch o mathematics, uised very popularly, for tasks rangin frae simple day-tae-day coontin tae advanced science an business calculations. It involves the study o quantity, especially as the result o operations that combine nummers. In common uisage, it refers tae the simpler properties when uisin the tradeetional operations o addeetion, subtraction, multiplication an diveesion wi smawer values o nummers. Professional mathematicians sometimes uise the term (heicher) arithmetic when referrin tae mair advanced results relatit tae nummer theory, but this should nae be confused wi elementary arithmetic. ↑ "Mathematics". Science Clarified. Retrieved 23 October 2012.